AAA projected that over 42 million travelers were going to hit the road on Memorial Day, almost 5% more than last year. And they’ll be sharing the road with motorcycles, which can be a scary proposition. Motorcycle fatalities have increased by almost 8% over the last few years, according to the National Safety Council. An umbrella can add an extra layer of protection to give all drivers peace of mind as summer gets in gear. How do you get this point across to insureds who may breezily overlook a personal umbrella policy because it’s not on their radar? Here’s a real-world case study from my files about a motorcycle ride that ended in tragedy and a $1 MM claim. Carrie and her twins, Audrey and Owen, were on their way to the lake on a sunny afternoon to celebrate their birthdays. Despite the festive occasion, the siblings began to squabble with each other in the backseat of the family’s minivan and became difficult to ignore. Distracted by trying to restore peace, Carrie pulled out of a gas station and didn’t see motorcyclist Joyce and her passenger, Carol. The accident happened in the blink of an eye and Carol did not survive the collision. Joyce suffered serious injuries to her legs and feet, requiring hospitalization, multiple surgeries and extensive physical rehabilitation. She also needed long-term psychological care. 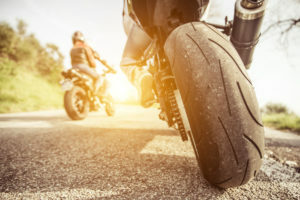 Joyce had Uninsured/Underinsured Motorist coverage (UM/UIM) on her motorcycle policy and excess UM/UIM on her personal umbrella policy, so her medical expenses and lost wages were covered after Carrie’s underlying auto liability policy was exhausted. If there’s an accident and the other driver is at fault and has limited (or no) coverage, your insured could be liable for the difference between what the underlying policies pay and their actual medical expenses. A personal umbrella policy with excess UM/UIM takes over when the other policies tap out — additional coverage is usually available in the millions. UM/UIM is insurance for their benefit and the benefit of their passengers — it takes care of bodily injury, lost wages, pain and suffering, emotional distress, co-pays and essential medical care, like physical therapy, occupational therapy and could even include complementary or “alternative” therapies. It’s affordable, too. Check out the premium compared to home/auto by running a quote with basic information (all you need is the number of cars, drivers and houses). The All-American road trip just got smart.